Health Junkie Mama: "If you can imagine it, you can do it." "If you can imagine it, you can do it." Every January people seem to be more motivated to eat better, spend less, workout more, etc. Well, every January comes for me and it seems to be the opposite with eating and spending. I don't really know why, but it can be frustrating. A couple weeks ago I got a groupon for Barnes and Noble and I bought the book below. 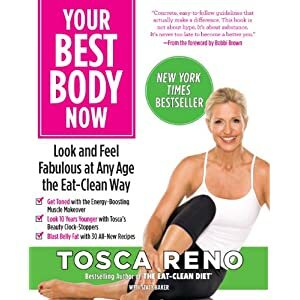 I've learned so much from Tosca Reno, and she's an amazing woman for turning her life around for the better at age 40. It's never to late to change something your really want to change. Tosca says "If you can imagine it, you can do it." Since I was a youngster I've battle with eating disorders and mentally abusing myself (wow, I just got personal). Any way from abusing my body I now have created new problems with my health (don't worry nothing major). Over the past few days I've wanted to just give in and not try to fix these problems. It seems much easier that way. And then I remembered "anything worth having, is worth working for (I don't know where I heard this quote)." Well, with some help from a greater power, a supportive husband, and a good friend. I'm going to commit to fix them once and for all. Putting a band aid over it the past 16 years has only brought me back to ground zero, time after time. It always seems easier to just let the problem be, but if it makes you feel anxious inside...it's time to change it. I've wanted to blog for sometime about how my passion for health and wellness started. I would like for my readers to really know me. This post kind of came out of the blue. In fact, I had no intention of posting this until I started writing. This isn't for you to pity me, it's for to know me and where I come from. We aren't perfect, crazy I know!! Life is a journey, and we need to enjoy it's ups and downs. The past week or so I've run across some awesome readings that will help you get on track if you are trying to clean up your eating, or if you want to take the processed sugar out of your diet. I found a great break down from Kori's blog (posted below). Kori an awesome blog. Click here for other great ideas. Beginner level: Take out all refined sugars including corn syrup and white sugar. Also remove all white flour from your diet, as it’s also very sugar forming.You will need to read labels carefully when buying prepackaged foods. Instead use natural, more unrefined sugars such as rapadura, coconut sugar, honey, stevia. Moderate Level: Remove all natural sweeteners as well, and only use fruit to sweet foods. Consider removing other starchy foods that can also feed yeast, or make you crave sugar more. Advanced Level: Take out all sugar forming foods, including most grains, starchy root vegetables like potatoes , and fruits. Buckwheat, Quinoa, Millet are non-starchy grains that are generally acceptable on yeast free diets. Please, beware, if you have a yeast issue, taking out the foods that feed it may make you detox and have a die-off effect (which can make you feel sick and miserable). If you have any illness or health issue, you should consult your health provider before trying a anti-yeast diet. Tips from Tosca Reno. Click here for her website. 1. Adjust your plan. If you find you're having trouble sticking to the steps you've outlined in your plan to achieve your goals, you need to assess what is hindering you. Reflect on which parts of your plan are not working and adjust them accordingly. 2. Celebrate the little victories, too. Have you lost five pounds of the 20 you aim to lose? Did you run one kilometer of the five you want to run by the end of next month? Those are big strides on the way to your larger goal and you should be proud of yourself! Recognize that you're doing well and use that to stay inspired! 3. Choose wholesome rewards. Instead of celebrating your achievements with unhealthy treats, give yourself a gift that helps you stick to your resolution. Buy yourself a new water bottle, borrow a new book from the library, take a hot bubble bath or go for a coffee - you earned it! 4. You are worthy. Remind yourself that you deserve to achieve your goals! Next time you find yourself making excuses for not staying on track with your resolutions, remind yourself that you are worth making the effort to follow through. 5. Take it day by day. You will encounter false starts and challenges. But you will also experience progress and triumphs. Don't give up on the big goal because you aren't seeing immediate results or you've slipped up a few times. As long as you remain consistent, you don't have to be perfect. Patience and the ability to pick yourself up and dust yourself off will eventually bring you to your goal. Remember, resolutions are difficult by nature. If they were easy, you wouldn't have to work so hard at sticking to them. Each day that you stick to your resolutions is one more step towards making them a lifestyle! Happy Learning!! Enjoy your week.